It’s the Road To Perdition meets State of Grace, and what we end up with here is a movie with an intriguing premise that just kind of falls apart and becomes routine in its second half. A movie that takes the parts of other, better, films, and tries to rework them, the storyline here might be recycled, but at least it does a nice job of that. It puts the pieces together nicely, combining The Road to Perdition, State of Grace, and eve Judgement Night. What it doesn’t do is carry through with these pieces to give us a second half that measures up to the first. In the first half of the film, we have all of the relationships and setup. It all leads to the initial conflict. And then the rest of the movie is spent on the run. They try to throw things into the second half, such as a new and accomplished hitman as another antagonist, or multiple visits to different characters who have nothing to do with anything, and all of it just takes us out of the film. The momentum and story we care about lies with Liam Neeson and Ed Harris. So long as its about the two of them, the movie works. When it gets away from them, it doesn’t. 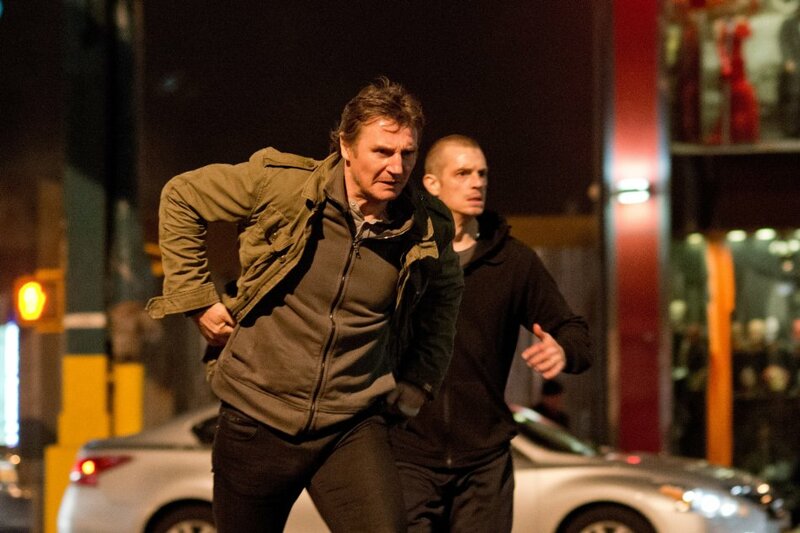 Run All Night is another in the Liam Neeson action movie genre, that turns out to be a just-okay movie. As far as Neeson goes, his career in the past decade has pretty much been defined by these kinds of movies. It all started with Taken, a fantastic film, and by far the best of the bunch.That movie was so good that it spawned two sequels, (both of which, were pretty lousy.) But while making those sequels, Neeson was also making other action films. He made Unknown, Non-Stop, and now Run All Night. Every one of them was a sort of B pciture with a decent enough premise, but some only average execution and follow-through. Every one of them was directed by the same man, Jaume Collet-Sera. Clearly he has a pretty good working relationship with Neeson, and considering that the two of them are three for three regarding giving us fairly decent movies, you can kind of understand why the two of them keep on reteaming. Run All Night is actually the movie, out of the three films this actor-director team have made together, that has the weakest storyline. Credit that to the fact that both Unknown and Non-Stop were fairly original ideas. 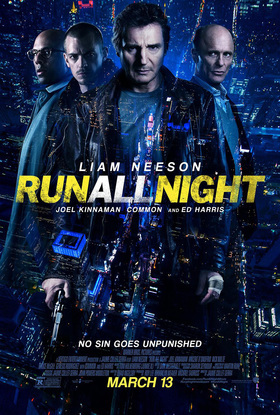 With Run All Night, we have definitely seen this sort of thing before. The plot involves an aging, way past his prime, former mafia hitman, having to spend the night helping his son escape the mafia enforcement and hitmen who are now coming for him. There’s a reason why this feels familiar. It’s The Road to Perdition set in the modern day. You see, The whole mess that leads to this began with something the son saw, that he wasn’t supposed to, and now the big boss has called in men to take him out, despite the fact that the father works for the boss. Add into that equation a bit about the boss’ son, being a screwup who crossed lines he shouldn’t have, to make this situation inevitable, (like Daniel Craig playing the son to Paul Newman in Perdition.) Then add the specialty hitman who is called in (Jude Law in that film, and Common in this one,) and you can see that the connections just keep on piling up. In addition to The Road To Perdition, Run All Night also has a decent amount of similarities to the Ed Harris film State of Grace. First and foremost, is that Harris is playing the mafia boss in both movies. He’s the man behind everything. Then there are the connections of how Harris’ character, Shawn MaGuire, used to be a low level guy working alongside our hero, Jimmy Conlan (Neeson.) The two of them grew up together. In State of Grace, Harris was the older brother to Gary Oldman, and Oldman and Sean Penn, (the protagonist,) watched Harris grow up and become boss. And then there’s the family screwup idea. In Perdition it was Daniel Craig as the boss’ son. In this movie, it’s Shawn Maguire’s punk son, Danny Maguire. In State of Grace, it was Oldman as the kid brother. So in many ways, Run All Night feels familiar. Consider that it takes the best parts of some movies that we’ve seen in the past. And yet it only holds onto those moments in the first half, before becoming its own thing. That sounds like the second half, where the movie breaks free of the mold, would be better than the first. The truth is, it’s the exact opposite. You see, the first half of the movie, about the relationships between characters, the back-story, and the establishment of the plot, at least had something going for it. It combined the premise of only two other movies, and did so pretty nicely. It even threw its own ideas into the mix every now and again, such as having Jimmy be a drunk has-been. At the start of the movie, he is passed out in a booth at the local bar. Then he is begging for money from the boss’ son to get his heat turned back on. Finally he is playing Santa Claus while drunk and around a bunch of children. He burns his hand, is held under a cold shower by some of the mob guys, and is clearly a mess. This is not your typical hero. It is just a coincidence that the limo driver who happens to be driving the Lithuanian drug dealers is Conlan’s son, Mike, (Joel Kinnaman.) These Lithuanians are doing business with Maguire’s son, Danny. They gave Danny a lot of money to set up a meeting between them and his father. When Shawn rejected the offer of the Lithuanians to help them sell heroin on the streets, the whole thing went south. Now, this is Danny’s mess. Since the deal isn’t happening, he needs to give the Lithuanians back their money. Instead, Danny shoots them. And Mike sees the whole thing from the front seat of his limo. To make matters worse, Danny spots Mike and chases him down. The chase scene, through multiple back alleys, is pretty fantastic. In fact, a lot of the action and camera work in this first half is pretty great. There’s the bullet-time action in slow motion that opens the film during a shootout in the woods. Granted this moment completely telegraphs the ending, without even making an attempt to disguise it, but so what. It makes us want to get to that point later on and see how the story gets us there. And then there’s the rapid speed camera movement that zooms us in and out of the streets of Manhattan, from one location to another. This is used to help present a change of location and moving across town from one spot to the next. The camea cranes back and pulls up over the trees before locating another spot in the city and then zooming down to find it. This is some pretty cool stuff. Unfortunately, once we get past the initial premise, where Jimmy kills Danny, Shawn’s son, before Danny can kills Mike, things start to turn south. Jimmy calls Shawn to tell him that he just killed his son. Shawn says that Jimmy and Danny are both dead men, and that’s where the cliches begin. Another one of these tired cliches is the rogue detective, played here by Vincent D’onfrio, who has been after Jimmy all of these years and completely dedicated to getting his man. Why doesn’t this detective archetype character ever have a partner who is just as invested as he is? The rare movies that do this, and give us two partners instead of one rogue cop (like The Departed with Mark Wahlberg and Martin Sheen,) are always so much more interesting. The only thing worthwhile about the detective storyline, here, in Run All Night, is that Jimmy is made to be a bad guy who has murdered upwords of a dozen people over the years, and so the detective has just cause to be after him. Once Jimmy makes the phoencall to Shawn and Shawn calls in his men to go after Jimmy and his son, the movie suddenly falls into all of the usual traps of becoming nothing more than routine. The story is now completely about Jimmy and Danny spending the night running around trying to avoid their attackers. Say what you want about this movie, but at the very least, the title is pretty accurate. There’s a cool police car chase with Jimmy knocking the car of corrupt cops off the side of the road, but after that, it’s just Jimmy and his son running around. They fight on a subway platform, dive through hallways in an apartment, and spend the movie trying to survive. There are two main things that happen in the second half that don’t work for the film. The first is that a specialty hitman is called in. As played by Common, this man has pretty much no dialogue at all. I suppose it’s always this way. And he has a cool green glass piece that goes over one of his eyes to give him night vision. But the problem is that he keeps missing his target, despite having a red laser pointer aimed right at him. On top of that, are we really to believe that Neesan’s old, drunk Jimmy Conlan would be able to match this guy in a hand to hand fight? Common’s hitman character doesn’t do much for the story until his final scenes. In fact his big scene in the apartment building, in many ways feels like it’s out of Judgement Night, with characters going from door to door looking for someone. The other mistake is that our main characters keep going to visit people for no good reason at all. They go to visit Mike’s Uncle, (Jimmy’s brother,) who doesn’t do much to help them, but certainly does something pretty big to hurt them. Then Jimmy goes to visit an older woman in the hospital, without any words exchanged or idea of why. This is what deleted scenes are for. And then there’s the middle of the movie meeting where Jimmy goes to a restaurant and sits down at a table with Shawn for a talk. I understand that this is trying to be the Heat moment, of the two heavy-weight actors sitting across from each other at a table, making threats, in the middle of the movie, but here, it doesn’t seem very realistic. At the very least, Jimmy would not be able to walk out of there so easily. And that’s pretty much where the film goes wrong. At best, it takes the parts of other, better movies, and tries to rework them. At worst, it’s simply just about two guys running around town, trying to avoid their captors and make it through the night. This is a movie that starts out pretty cool, but definitely loses steam and momentum as it goes on.